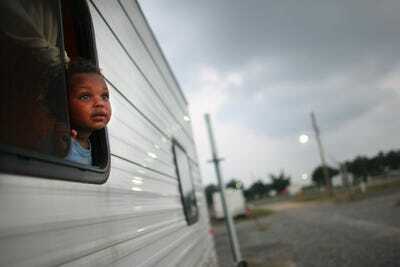 Mario Tama/Getty ImagesOnly half of children today earn more than their parents did. 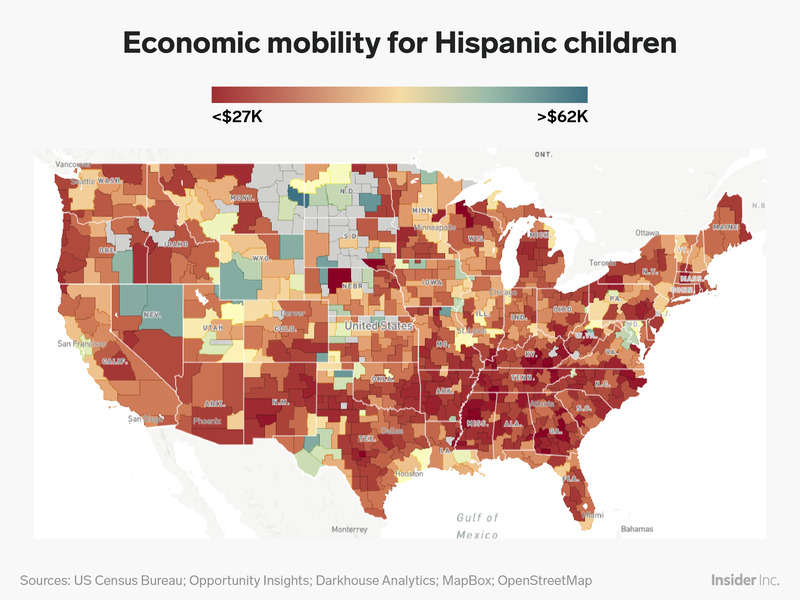 A new mapping tool from the US Census Bureau and a Harvard-based policy group analyses the economic mobility of 20 million Americans who are now in their thirties. Across income levels, American Indians saw the lowest levels of economic mobility compared to the national average. But black men saw the most persistent barriers to mobility, regardless of whether they grew up poor, middle-income, or wealthy. A new mapping tool from Harvard-based policy group Opportunity Insights reveals just how difficult it can be to overcome race-based economic barriers in the US. While a person’s neighbourhood can have a significant impact on future earnings, the effects of race seem to run deeper than any town, city, or state line. In coordination with the US Census, the researchers compiled a detailed record of economic opportunity across individual neighbourhoods. The data traces the average household income of 20 million Americans who were born between 1978 and 1983 and grew up in a given Census tract. The results can be sorted according to race, gender, and parental income, giving a highly nuanced depiction of where – and under what conditions – the American Dream is made possible. The researchers discovered, for instance, that poor children who grew up in Charlotte, North Carolina earn an average of just $US26,000 as adults in their thirties. And in Miami, Florida, areas that have more two-parent households tend to have higher rates of upward mobility. 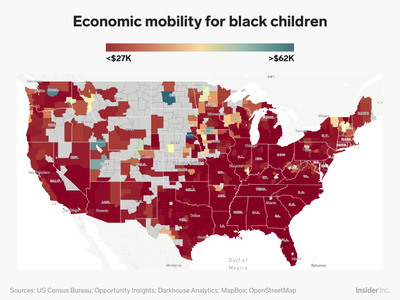 But when we look at children across all income levels and neighbourhoods in America, we find a more sweeping picture of how race restricts economic opportunity. Take a look at the maps below. The above map shows the mobility levels for children who grew up in different income brackets. The scale ranges from red to blue, with blue representing mobility levels that are higher than the national average and red indicating mobility levels that are lower than the national average. Here we see that economic mobility is lowest in the South – particularly in states like Georgia and Mississippi. 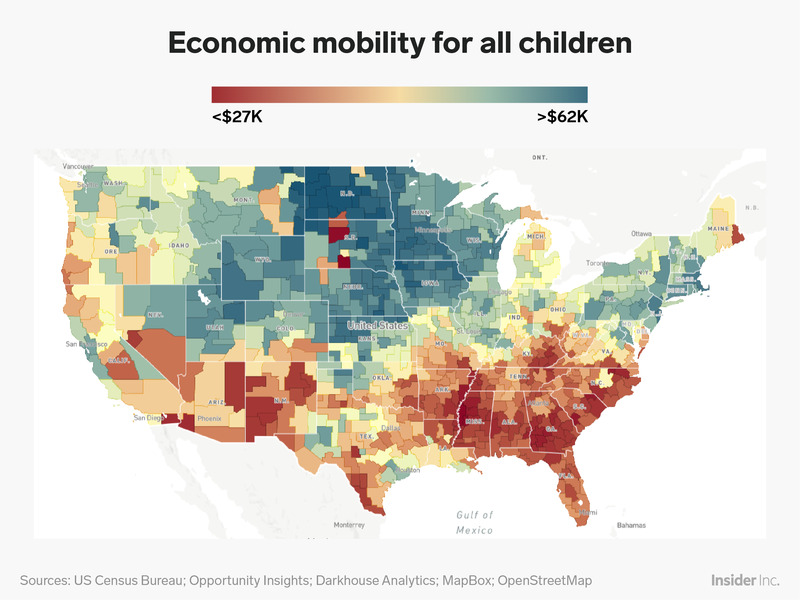 By contrast, North Dakota has some of the highest levels of economic mobility, along with other Great Plains neighbourhoods. These results change drastically when we filter for black Americans who grew up with varying income levels. The map becomes a sea of dark red, with only a few blips of orange, yellow, and blue. The few exceptions are neighbourhoods in Utah, Washington, Iowa, and the Dakotas, though each of these states displays its fair share of red. This means that black Americans saw lower levels of economic mobility across many neighbourhoods in the US, regardless of whether they grew up poor, wealthy, or middle-income. Even when we filtered for income level, there was little variation in the map’s colours. The researchers determine that these lower levels of mobility apply predominantly to black men. 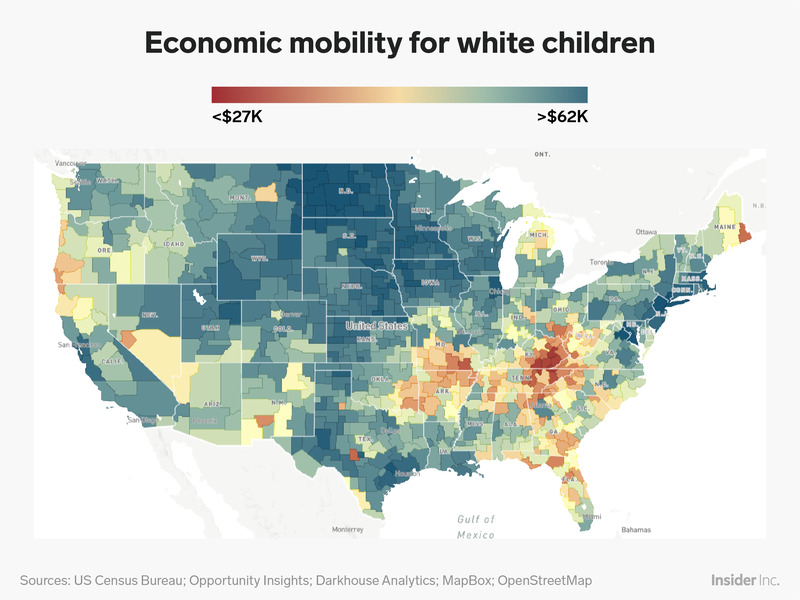 The map for white Americans who grew up with varying income levels is almost the exact opposite: It’s covered in shades of blue, with sparse patches of yellow and orange (levels of economic mobility that are close to the nationwide average). For the most part, neighbourhoods where white Americans grew up to have particularly low levels of economic mobility are located in Kentucky. By contrast, New England and the Great Plains saw the darkest shades of blue, along with select areas of Texas and California. This data changes when we filter for childhood income levels. When we look at white Americans who grew up poor, the map becomes mostly red. But when we consider white Americans who grew up wealthy, it transforms into a giant stretch of deep blue. The map for Hispanic Americans is mostly orange, with a large swath of red along the South. While Hispanic children from high-income neighbourhoods seem to have a better chance at moving up the economic ladder than black children, for the most part their mobility levels are commensurate with their socioeconomic status growing up. Asian Americans, on the other hand, have consistently high levels of economic mobility. Even Asian children from low-income families often out-earn their white counterparts. Although this map is not quite as robust as the map for white Americans, it, too, is covered in shades of blue. Neighbourhoods where Asian Americans saw the most economic mobility are located in the Rust Belt, a region in economic decline. 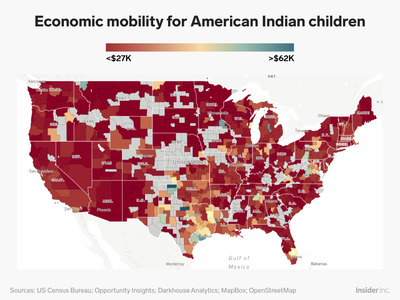 No group was more disadvantaged compared to the national average than American Indian children. Almost the entire map is covered in red, and there are even fewer patches of yellow, orange, and blue compared to map for black Americans. That said, American Indians had a slightly better chance of improving their economic condition if they were raised in a high-income household. This suggests that, of all the children represented in the project, black males face the most persistent obstacles to climbing the economic ladder.